I use a 40W iron, and I've never had a trace burn out. I've got another Rissole layout with slightly thicker traces, but haven't shared it as I haven't had it fabbed and tested. 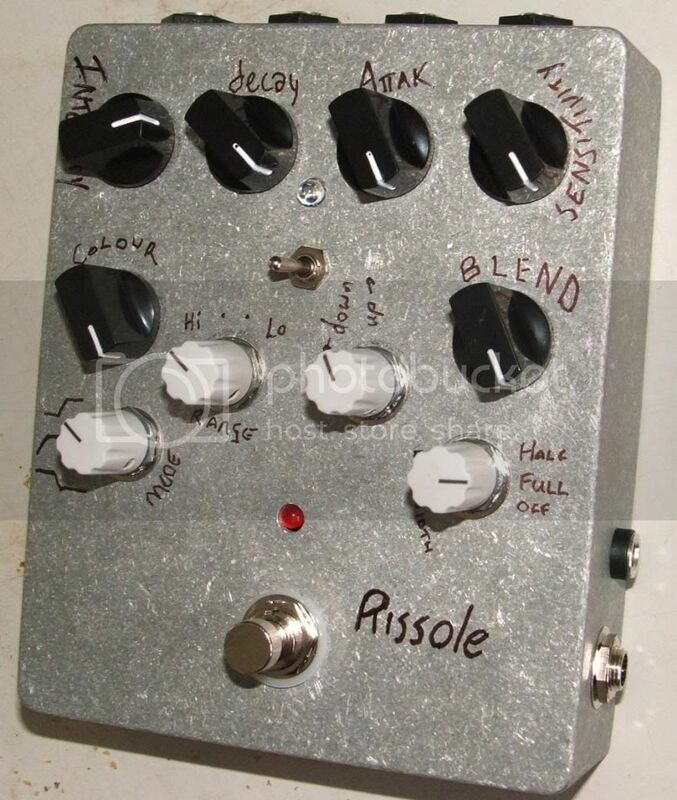 Reviving a super old post here, but I just picked up a Rissole Meatball clone on Reverb. It's got same layout as the one posted here, though it has a crazy psychedelic paint job. What does that toggle switch in the middle do? Mine just seems to make a loud popping noise and makes the middle green LED come on, but I'm guessing it must have some other purpose. Thanks! Stock, Q stays constant as the frequency changes. With the Moog Mod turned on, Q decreases with frequency. It can make the filter more usable with bass guitar. Awesome, thanks so much for the reply! Were the Rissole kits widely available, or just sold / made by someone here on this forum? I sold a few blue-pcb Rissole 1.4 boards here, on the forum. After they were all gone, I shared the project on OSHpark. Some... person... downloaded the gerbers from OSH, got a load cheaply made in China, and started selling them on ebay. With no word to me about it. I don't share my new projects on OSHpark anymore. Ugh, sorry to hear that. I haven't opened it up yet, so not sure if this is one of the original batches or chinese take out. Thanks for your work on the project though! It's pretty awesome to be able to have a Meatball without taking out a second mortgage on the house. yeah I saw that person selling clones using your boards. Then I saw he posted guts and its clearly your work that he has totally ripped.